The young reader inside John Rapp is alive and well. Photo by Rebecca Peng. 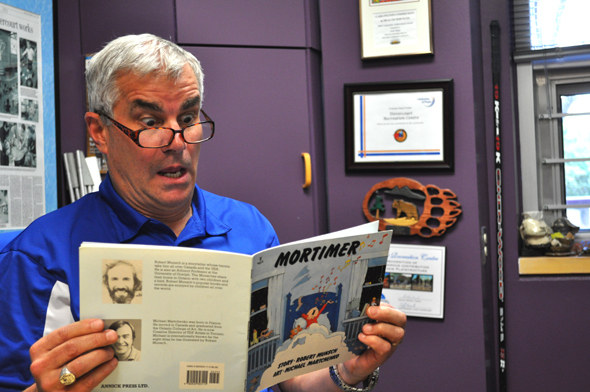 Dovercourt is full today, with over 700 campers attending programs this particular week, and Rapp sits himself down in the middle of a group of twenty-five of them while Charlotte Scott-Frater, the camp counsellor, reads his summer book of choice: Mortimer by Robert Munsch. In moments, the campers – and Rapp – all sing a refrain that is familiar to so many parents: “Clang, clang, rattle-bing-bang! Gonna make my noise all day!” All of them are enveloped in the classic story of a very loud child who doesn’t want to sleep. When the noise finally dies down, Rapp explains his love for Munsch and Mortimer. Now that his kids are 18 and 20, he’s not reading a whole lot of Robert Munsch in the evenings, though he still reads with his children in mind. Rapp believes that when you have a teenage daughter, anything they want to talk to you about should be celebrated. This post is part of our annual KT summer reads issue. Read all of our other profiles right here.